At Great Lakes ENT Specialists, we diagnose and treat all types of facial skin lesions with an emphasis on facial skin cancer. Treatment for facial skin cancer depends on the type, size and location of the cancer, as well as your overall health. Small lesions limited to the surface of the skin can often be removed with a simple skin biopsy. 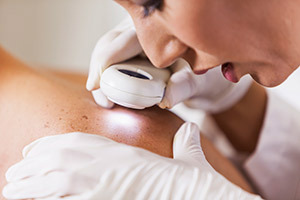 Other superficial skin cancers detected early can often be removed by freezing with liquid nitrogen or vaporizing with laser therapy. Excisional surgery or Mohs surgery for larger growths, can also be effective in cutting out cancer without causing damage to the surrounding skin. When surgery isn’t an option, radiation therapy may be recommended. Chemotherapy involves the use of creams or lotions that contain cancer-killing drugs applied directly to the skin. This treatment is especially effective in cancers that are confined to the top layer of skin. For cancers that have spread to other parts of the body, systemic chemotherapy is often effective.